uofinocomment.com No Comment Co-ed A Cappella! 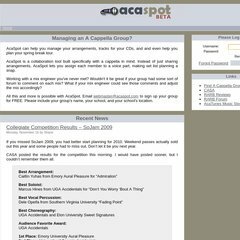 Acaspot.com's IP address is 69.89.31.105. It has 2 DNS records, ns2.bluehost.com, and ns1.bluehost.com. It is hosted by American Registry For Internet Numbers (Virginia, Chantilly,) using Apache web server.